The IIoT edge is still in the development stage regarding solidification of its ultimate role in emerging IIoT architectures, but there is no doubt as to its rising importance in fulfilling the IIoT vision. As industrial internet strategies are evolving, so too are the functional capabilities of the enabling edge infrastructure devices. In the IIoT gateway and router market, this expanding functional spectrum provides both IT and OT suppliers with more options as to where to position device offerings. New offerings, including highly functional low-cost devices, target a variety of points along the broadening price/performance spectrum associated with the edge. Availability of high-end edge computing platforms capable of supporting instances of cloud-centric applications has been true for some time, particularly since introduction of the Intel IoT gateway platform and industrial edge offerings from IT players like Dell, HPE, Nebbiolo, Stratus, and some of the industrial PC (IPC) players. Capabilities at the high-end edge continue to extend with introduction of powerful edge servers and high-end edge nodes that possess extensive compute and storage capabilities. Significant activity is also occurring at the lower end of the spectrum. The price/performance of new gateway and routers continues to escalate as incremental processing capabilities are added at lower cost, a trend that is particularly evident in the cellular market. Average prices are declining overall in the face of increased competition and greater incorporation of COTS-based technology. Inherent in this broadening spectrum is continued convergence of compute and connect capabilities. Use of IIoT gateways and routers as straightforward connectivity mechanisms continues, but the trend toward incorporation of incremental edge-to-cloud integration and local compute and store capabilities is apparent. Suppliers must evaluate how much and what type of this functionality makes sense in their served applications, regardless of where the device lies on the functional spectrum. 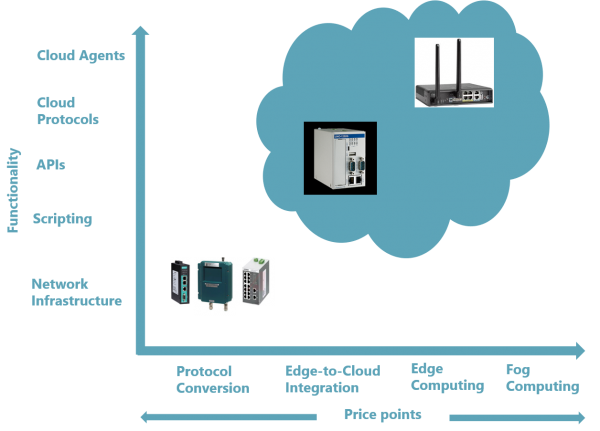 Some suppliers, such as Moxa, are pursuing a two-tiered approach that relies on IPC-type IIoT gateways for edge-to-cloud integration and edge computing and separate automation form factor gateways for automation protocol integration. One benefit of this strategy is that it eliminates the need for the IIoT gateway to support dedicated serial hardware interfaces from the field and the polling versus pub-sub protocols typically associated with them. Information for this blog was drawn from ARC’s recently released report, IIoT Gateways & Routers 2017-2022. For more information on this and other available ARC market research on the IIoT network edge, see our dedicated IIoT edge research webpage. You can also join the conversation about this exciting topic on ARC’s blog sites or LinkedIn Groups: IIoT and IIoT Network Edge.